Victoria’s Stravadoodler wishes you a Happy Easter! He gets oodles of ‘eggs-ercise’ as he hops to and fro delivering Easter treats. So does Victoria’s Stravadoodler as he pedals to and fro doodling giant bunnies and Easter greetings. It took 75+ kilometres of cycling to Strava-sketch this Easter message and the big Easter Bunny who’s holding an ‘egg-citing’ gift just for you. 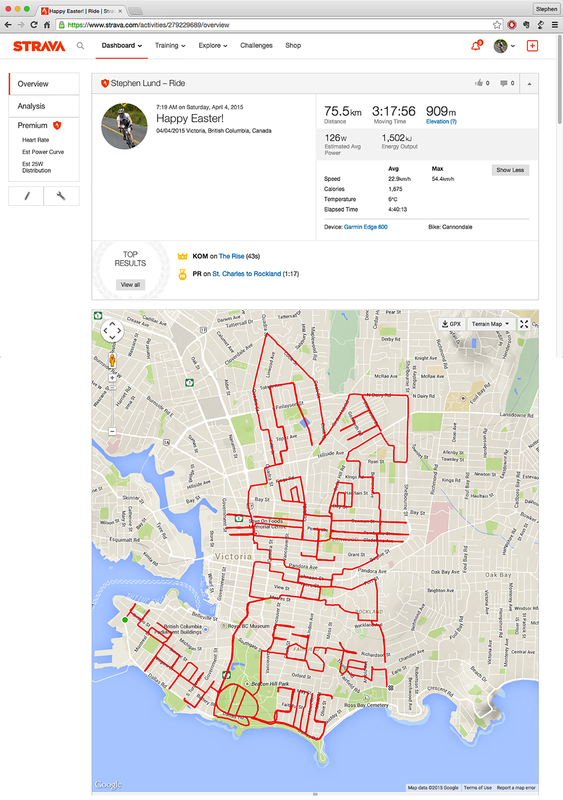 This entry was posted in bike-writing, gps art and tagged bike-writing, creativity, cycling, Easter, Easter bunny, Easter egg, garmin, gps, gps art, holidays, strava, strava art, victoria bc. Bookmark the permalink. 4 Responses to How does the Easter Bunny stay healthy? You probably get to eat a few extra chocolates for all this energy you’re expending! Jean…I will definitely use it as an excuse to overindulge on Easter goodies! Brilliant, simply brilliant! Plus a sneaky KOM in the process! That KOM was MY Easter egg!